OPERATION AVALANCHE Review | Warped Factor - Words in the Key of Geek. Matthew Kresal goes to the Moon. Will be back for dinner. Normally the “we faked the moon landings!” conspiracy theory makes my blood boil. That is even more true when people go out and make 'documentaries' trying to prove it to actually be the case. That said, the idea has produced some good fiction in its time, including the 1970s conspiracy thriller classic Capricorn One. Added onto that list as well is this film, a indie made period thriller with a neat twist. That neat twist is that it looks and feels like a documentary being made in the 1960s. 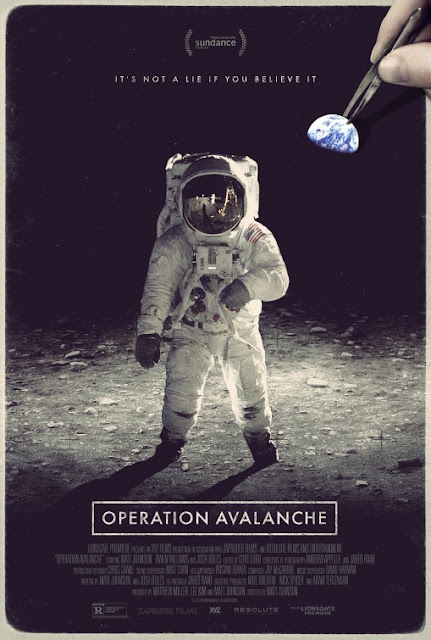 Operation Avalanche claims to be a documentary following a group of CIA recruited filmmakers led by Matt Johnson (playing a fictional 1960s version of himself) whom, upon discovering NASA is behind schedule, convinces his bosses to let him and his team stage the Apollo 11 moon landing. If nothing else, it is a great way to bring to life an old idea. In fact, it is the documentary style nature that makes this film. Johnson and many of his lead actors are playing fictional versions of themselves and (as the DVD extras reveal) there was a large amount of improvisation of dialogue going on, something which is evident. Not in a bad way, rather it means that there's always the sense that these are people in the heat of the moment. Their reactions to things are never over the top but range from the comedic to the panicked, all of which are believable as the events take on an increasingly darker tone. Yet Operation Avalanche has more going for it than just a good idea. Despite being indie made, it features some of the finest period production values for a film set in the 1960s that I can recall seeing in recent memory. There are cars, clothes and yes even sets. It's the sets that are among the most impressive elements of the film, including the construction of one that represents the Eagle lunar module on the Sea of Tranquility. As a NASA buff, I was impressed by the level of detail put into the film's NASA focused elements, right down to recreating moments from a couple of later Apollo landings. It's impressive to say the least. The highlight, though, might be in the cinematography and effects. 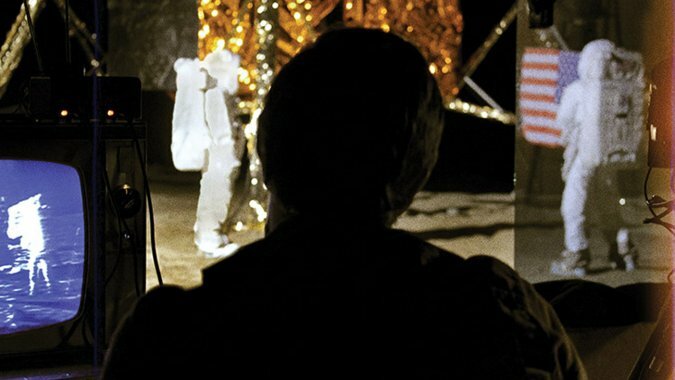 Operation Avalanche has the look and feel of 16mm 1960s film, containing the right amount of grain and an occasional washed out appearance to it. The camerawork plays well with the found footage format but also manages to avoid much of the shakiness that has become an all too frequent part of the genre. Indeed, it is to the credit of the filmmakers that they find just the right balance to make it believable but also not a frustrating (and for some even nausea inducing) experience. The effects, meanwhile, are subtle and impressive, often finding ways to put the actors into real-life NASA footage, including an impressive sequence in Mission Control where the footage works brilliantly with the scene playing out. The most impressive sequence of the entire film might well be the CIA filmmakers visit the set of Kubrick's 2001 in the UK, complete with Stanley Kubrick himself. It's something that sets this production apart from not only many indie films but big budget conspiracy thrillers as well. All of this makes Operation Avalanche an impressive piece of work. It's an incredibly well made film, combining a period setting with a thriller plot told in a documentary style. This helps in making the outrageous premise believable, presenting an (on the surface at least) idea of how the moon landing might have happened. If you enjoy conspiracy theories or the found footage genre, this is well worth a watch.